Read the regulation covering the policies and procedures for the nomination, selection, and induction of personnel into the Chemical Corps Hall of Fame (HOF) and designation of the Distinguished Members of the Corps (DMC) and for the maintenance of records pertaining to these actions. Distinguished Member of the Corps: This award is extended to those who served the Corps in their professional lives and continue to serve it in their personal lives. Nominations are limited to personnel who have been retired from active federal service (military or civilian) for at least 2 years. Active Army military and current (non-retired) federal civilian personnel are not eligible for the program. 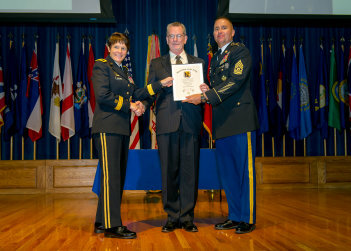 Nominations are being accepted for the Chemical Corps Regiment Distinguished Member of the Corps Honors. This award is exteneded to (living or deceased) members who served the corps in their professional lives and continue to serve it in theri personal lives. Monimantions are limited to Military and Department of Defense civilians but they must have been retired from active duty or federal service (military and/or civilian) for two years. All packets must arrive before February 13th, 2019. For more information call (573) 563-7339 or email christy.lindberg@us.army.mil.